TOTAL FLANKER...a rugby blog: Is this England’s Unluckiest Player? Gutted to hear today that Manu Tuilagi will miss the rest of the season with an anterior cruciate knee ligament injury, having hobbled off early in Leicester’s recent defeat to Sarries in what was only his sixth game following a two-month lay-off with a long-standing groin injury. Tuilagi has been beset by injuries in recent years as a consequence of which he hasn’t managed to play for England since June 2014, a pretty horrendous run of bad luck. Owing to a series of well documented off-field misdemeanours, it was suggested to me recently that Tuilagi should be a candidate for the Total Flanker Hall of Wazzocks but, whilst some of his past immaturity may justify such a view, it would surely be somewhat churlish to induct him whist he is recovering from yet another serious injury. 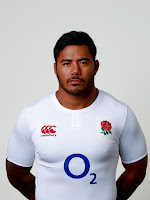 One crumb of comfort for Tuilagi is that, remarkably, he is still only 25 and has time on his side. It is about time someone carried on a study on the number of first class matches played yearly in the Northern hemisphere vs the number of first class matches played in the Southern hemisphere and correlated it with the average number of weeks a player is out of the game because of injury.